Breedlove Discovery Concerto Review – Big Love for this Breedlove! It’s safe to say that the guys at Breedlove don’t do things by the book. Whereas the market is made up of dreadnoughts, concerts and jumbos, the Oregon-based brand has their own collection of body shapes and sizes. And, as we hit 2019, things haven’t changed. Their brand-new DSCO01SSMA – alternatively known as the Discovery Concerto – features an all-new body shape that aims to accommodate both a big sound and a comfortable playing experience. Unlike a similarly named concert guitar, the new concerto features a bigger body that sits somewhere in between a dreadnought and a jumbo, despite retaining the elegant look of a concert. Here, Breedlove were aiming to create an acoustic with the tone and bold projection of a dreadnought, but with a more comfortable playing experience – and they have succeeded with the Concerto. With a lower bout of 16”, the Discovery Concerto certainly shows off some hefty dimensions, yet it doesn’t feel bulky to hold. It features a solid Sikta spruce top with okoume back and sides, all with an elegant gloss finish. The C-shaped neck is just as comfortable, with a slim profile and a solid nato construction, featuring a 20-fret ovangkol fretboard. The overall style can be described as minimalist, although a few details such as the black binding and the attractive rosette add a level of sophistication. For a guitar that sits in the lower end of the under $500 acoustic market, the craftsmanship is pretty high-end in its feel. Despite being made in China, it receives a stateside set-up and quality check at the workshop in Bend, Oregon, so you know it’s going to play well on arrival. Sitting on the distinctive Breedlove tapered headstock you will find a set of sealed die-cast golden chrome tuners, which are precise and capable of holding your tuning very well. Working down the guitar, there is a graphite nut and a matching graphite saddle on the ovangkol bridge. This bridge is pinless, which – besides some supposed minor tonal enhancements – means strings changes are simpler. We approve! Throw in a Breedlove gig bag as standard, and the value in the hardware department is pretty high. With the Concerto, we know Breedlove achieved their aim of creating a ‘big guitar’ with more comfort – so, what about the tone? Thankfully, despite not fitting into a classic guitar size, the Discovery Concerto offers a robust voice that really projects. It’s crisp, deep and bassy, and surprisingly complex for something so affordable. It copes superbly with big, aggressive strumming, rarely breaking up. However, fingerstylists and flatpickers won’t be disappointed, as it remains articulate and responsive to softer playing. Ultimately, it’s a great all-rounder, especially if hefty unplugged amplification is what you’re after. 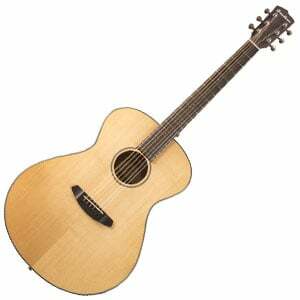 The Discovery Series has always been a fantastic way to grab an affordable Breedlove guitar. Truth be told, nobody was asking for the Concerto, although – with such a unique and complex tone – we are very glad it has arrived! Breedlove do offer some higher-end Concertos, but the Discovery Series at least gives you the chance to discover what all the fuss is about. For more info about the Breedlove Discovery Concerto, click here. For more acoustic guitars under $500, click here.